This weightless, alcohol-free serum utilizes cutting-edge skin and hair ingredients; fortified with Peptide and Stem Cell technology to address thinning hair directly at the follicle and help strengthen the hair. 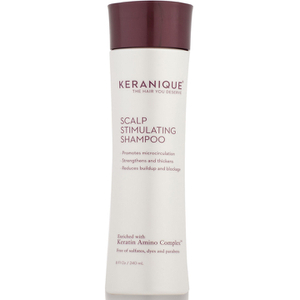 Keranique™’s Keratin Amino Complex strengthens and fortifies thinning hair, helps thicken each hair shaft, and helps repair the outer protective layer and repair split ends. A sheer, lightweight serum that bonds with hair’s Keratin to add volume and thickness to each strand and nourishes the hair follicle, promoting thicker, fuller hair. Use every day to increase the look of thickness and volume over time. Hair will be visibly denser, fuller and thicker. Weightless, alcohol-free, fast-absorbing daily treatment serum energizes the scalp and revitalizes hair follicles. Provides an optimal scalp environment to promote healthy hair and follicle stem cell growth. Helps optimize the hair growth cycle. Helps reduce inflammation on the scalp to support prevention of hair loss. Helps strengthen and anchor the hair at the root. Helps restore a healthy, fuller, more vibrant appearance to the hair. Fortified with Keratin Amino Complex to thicken, strengthen, and protect thinning hair. Vitaplex™Laminaria Digitata Extract and Carrageenan - Helps contribute to scalp energy and vitality in at the hair follicle. Protectagen™ Hydrolyzed Rice Protein - Helps support cell activity at the hair follicle. Towel dry hair. Apply Serum directly to the scalp and massage with fingertips. Do not rinse. Style as usual. 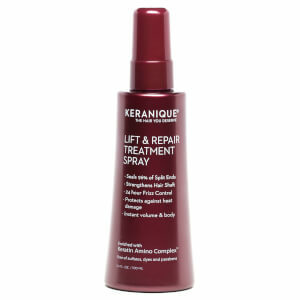 For even thicker, fuller hair, use Keranique™ Volumizing Lifting Spray during styling. Very good product range also been using the shampoo and can see a difference in frizziness and also the hair feels fuller and do not need to wash so often.. Love it.